Building on the flight heritage of the IFM Nano Thruster, the IFM Nano Thruster SE expands controllability towards active thrust vector control, without moving parts. The IFM Nano Thruster SE allows to actively control the resulting thrust vector, without any moving parts. It can therefore steer, correct for CoG mismatch, or can enable advanced missions requiring precise thrust pointing. 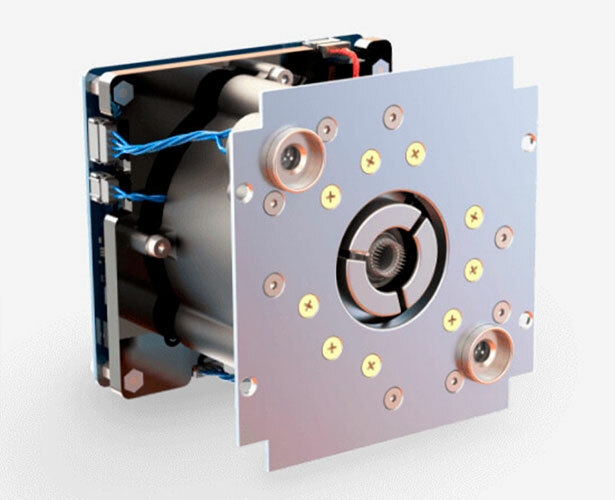 Due to the efficient ionization process, which allows the capacity to ionize up to 60% of the evaporated Indium atoms, the IFM Nano Thruster can provide a higher specific impulse than any other ion propulsion system currently on the market. The thrust can be controlled through the electrode voltages, providing excellent controllability over the full thrust range and a low thrust noise. The IFM Nano thruster module is used as a compact pre-qualified building block in order to provide custom solutions at a commodity price and ultra-short lead times Although, building blocks are completely self-contained propulsion systems, the whole cluster can be operated as a single plug-and-play unit. I give my consent to the processing of my personal data to receive updates and news from Enpulsion. ENPULSION is Driving Your Advance – Feel free to contact us! The IFM Thruster family is a mature technology, developed under ESA contracts for 15 years. We´re building upon our heritage whereas our home is in the presence, envisioning our future. Enpulsion is funded by Seedfinancing of BMWFW and BMVIT processed by aws. © 2019 ENPULSION GmbH. All rights reserved. Enter your details and click the button below to get access to the Data sheet.